About a week ago our latest study was published ahead of print in the International Journal of Sports Physiology and Performance. Smartphone-derived Heart Rate Variability and Training Load in a Female Soccer Team. Finally, in 2014 we implemented smartphone-HRV monitoring with a collegiate female soccer team throughout their spring season. The icing on the cake was having this paper accepted in IJSPP, a journal that I’ve been reading for years and that has published some very important papers that have advanced the practical application of HRV monitoring in field settings. The following will serve as a brief overview of the study. Up until recently, HRV data has been traditionally recorded via ECG in the laboratory or with heart rate monitors in the field. The cost and time consuming nature of data collection and analysis procedures with these systems make them prohibitive in team-sport settings. Smartphone HRV technology is an affordable, user-friendly and new alternative that has yet to be studied in the field. Smartphone apps utilize ultra-short recording procedures for HRV data acquisition (brief stabilization period followed by ~1 min recording). These modified recording procedures have not been studied in field settings and therefore it is unclear if meaningful training status information can be acquired with such short R-R interval recordings. It is unclear which position is more preferable for HRV recording. Parasympathetic saturation has been observed in highly fit athletes in the supine position. This is when HRV is low despite very low resting heart rates. Therefore, HRV measures following an orthostatic stimulus (upright posture) have been proposed for use in highly fit athletes to counteract saturation effects. More research to determine which position is most suitable for team-sport athletes is required. The weekly HRV mean and CV have been proposed to be more meaningful than isolated (once per week) measures. No previous research has assessed the evolution of mean and CV values in response to varying weekly training load in collegiate female team-sport athletes. Particularly from ultra-short, smartphone-derived measures. Lastly, previous work has demonstrated that HRV measured between 3 and 5 days per week was sufficient for reflecting weekly mean values in endurance athletes. It is unclear if this applies to team-sport athletes engaged in regular strength and conditioning and soccer training. Reducing HRV measurement requirements to between 3 and 5 days per week would make HRV monitoring much more practical for coaches and athletes by reducing compliance demands. HRV data was recorded daily by the athletes after waking with the ithlete smartphone app over 3 weeks of moderate, high and low training load. 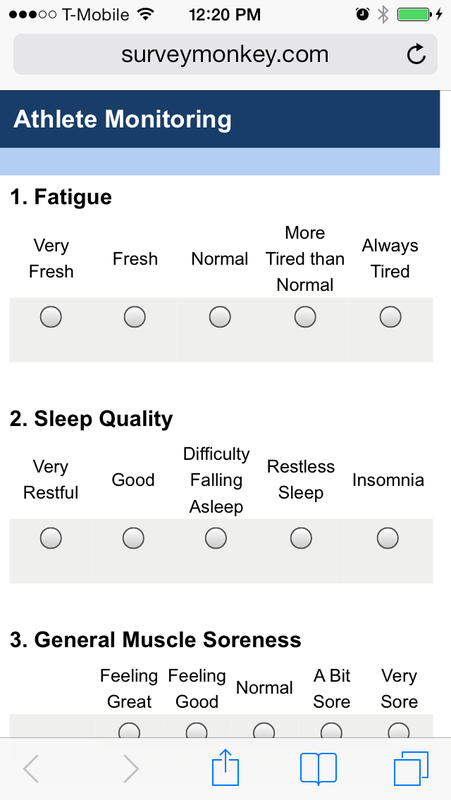 As this study took place before the Wellness feature was added to the application, Wellness measures (fatigue, sleep, soreness, mood and stress) were acquired on M-W-F of each week via SurveyMonkey (see guide here). 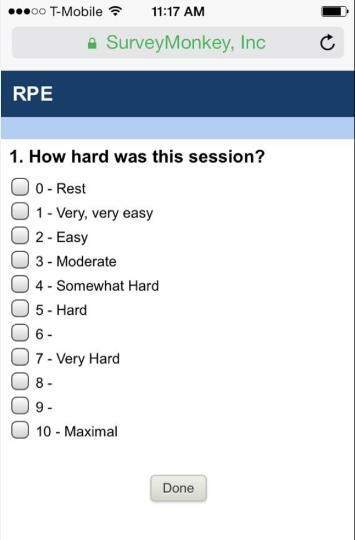 Training load was quantified via sRPE which was acquired between 15-30-min following all resistance training, conditioning and soccer practice sessions via email (SurveyMonkey) delivered to each athletes smartphone. The weekly mean and CV for HRV in both standing and supine measures was determined first intra-individually and then averaged as a group. This was also done for sRPE and Wellness values. The supine and standing HRV mean and CV were then determined for M-W-F of each week for 3-day values and again for M-T-W-R-F for 5-day values. These were then compared to the 7-day values (the criterion). The 5 and 3-day measures within each week provided very good to near perfect intraclass correlations (ICCs ranging from 0.74 – 0.99) with typical errors ranging from 0.64 – 5.65 when compared with the 7-day criteria. The supine values demonstrated a smaller CV compared to standing. Therefore the supine measures over 3 and 5 days agreed strongly with the 7-day measures. The standing measures, particularly when measured across 3-days showed the lowest agreement. HRV mean values demonstrated small effects in response to varying TL where the lowest HRV mean occurred during the high load week and highest HRV mean occurred during the low load week. The CV values were highest during the high load week and lowest during the low load week. The CV was more sensitive to changes in TL than the mean values (moderate effects). Wellness values were lowest during the high load week (moderate effects) and similar between moderate and low load weeks (trivial effects). This study demonstrated that the HRV CV showed greater sensitivity to the changes in TL over the 3-week training period. Essentially, during high load training, the athletes experienced greater fluctuation in their scores. Greater training stress caused greater homeostatic perturbation, reflected in their Wellness and HRV scores in both standing and supine positions. In contrast, during the low load week, there was less day-to-day fluctuation in HRV because there was less fatigue from training stress. Therefore, monitoring CV changes throughout training may provide insight regarding training adaptation. Athletes experiencing greater fatigue will likely show greater CV values. More experienced athletes and those with higher fitness will likely demonstrate lower CV values. When these athletes show increases in the CV, it may be due to non-training related stressors. Comparing individual values to the group average will help identify athletes who may require further follow-up to determine if training of lifestyle modification is necessary. Smart-phone derived, ultra-short HRV is a potentially useful, objective internal training status marker to monitor the effects of training in female team-sport athletes as part of a comprehensive monitoring protocol. Coaches and physiologists are encouraged to evaluate the weekly CV in addition to the weekly mean when interpreting HRV trends throughout training as this marker was more sensitive to TL adjustment in the short-term (i.e, 3 weeks). An increase in lnRMSSDmean and decrease in lnRMSSDcv were observed when TL was reduced following moderate and high TL weeks and interpreted as a positive response. Both supine and standing CV measures related well to TL in this study but only supine CV values acceptably maintained this relationship when assessed in 5 and 3 days. Therefore, caution should be used when evaluating standing HRV when only 5 or 3-day measures are used. Seated measures may provide a lower CV relative to standing while still providing an upright posture to counteract possible saturation effects. This may make seated measures preferable to standing as a lower CV is more likely to be captured in fewer than 7 days as demonstrated with the supine values. Reducing HRV data collection to 5 days per week may alleviate compliance demands of athletes and thus may make HRV implementation a more practical monitoring tool among sports teams. This entry was posted in Heart Rate Variability, Monitoring and tagged analysis, athlete monitoring, athletes, heart rate variability, HRV. Bookmark the permalink.